Good morning, dear tea friends! It’s that time of year again when not only are the first flush Darjeelings being harvested in India but the Pre-Chingming teas are being harvested in China. 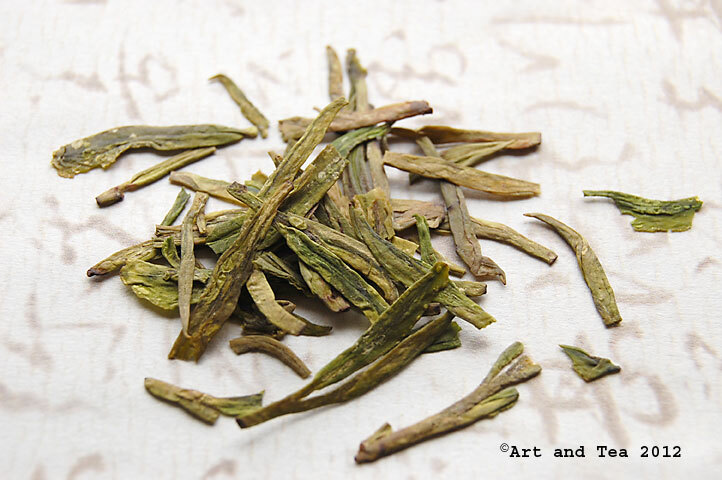 In my cup this morning is a Pre-Chingming Lung Ching which I am happy to introduce to you. Chingming, or Qingming, is a festival in China, usually celebrated on the 15th day from the Spring Equinox, or April 5th. It is a day for going outside to enjoy the return of greenery and tend to the graves of departed loved ones. So, Pre-Chingming refers to the tea being plucked before this festival time. This particular tea was harvested in China within the last few weeks. 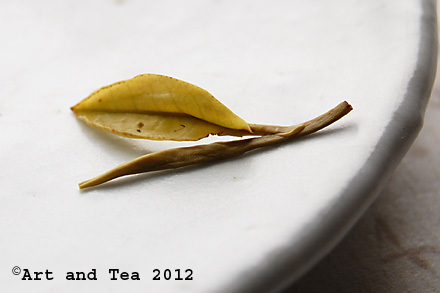 Lung Ching tea, a very popular and well known tea from China, has a distinctive flat shape to the leaf after processing. This flat shape is intentionally caused by the motion of the pan when the leaf is heated to stop oxidation. Its name means “Dragon’s Well”, referring to the place where it has been traditionally grown. Legend has it that a Taoist priest in the 3rd century advised the local villagers to pray to the dragon of a local well to bring rain and end their drought. It worked and the well was named after that dragon. The Dragon’s Well monastery still stands in that spot to this day. 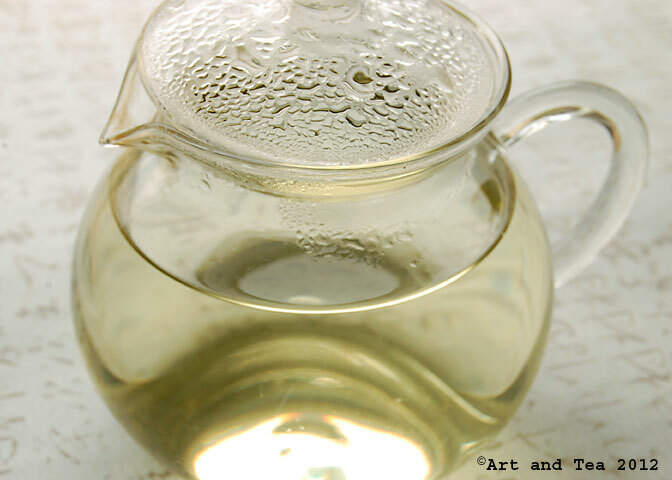 The color of the leaf while steeping is such an amazing spring green, don’t you think? I steeped the leaves for 3 minutes in 180 degree F water. Seeing such an intact leaf is a gift. I imagine a field of women deftly plucking the delicate leaf and tossing it into the baskets strapped to their backs. They methodically make their way through the rows in the crisp spring air. 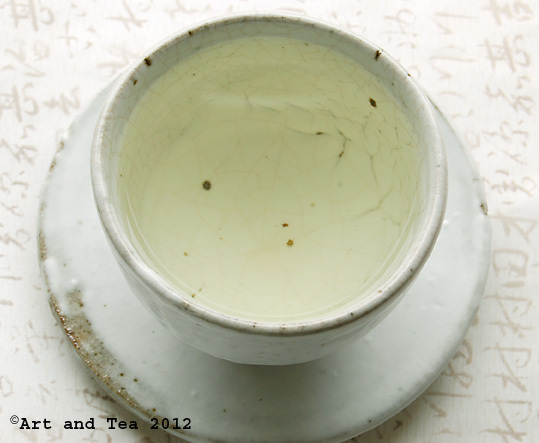 The tea liquor is so pale, like straw, with a whisper of green tinge. 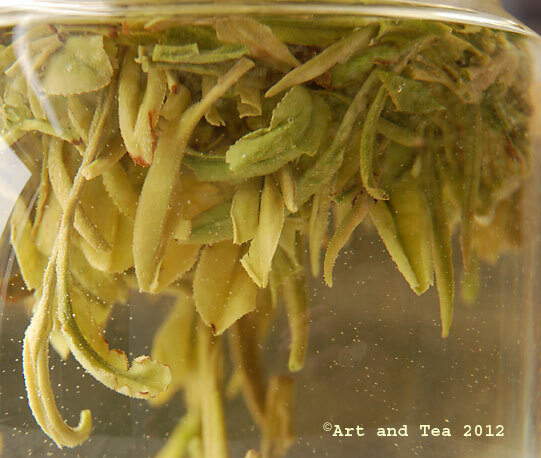 It’s as delicate as a white tea with a complexity of flavor showing its high quality and care in processing. The aroma is slightly nutty with a note of fresh early corn. So very pale and delicate yet so very flavorful with notes of sweet nectar, melon, a hint of grapefruit and that delicious note of sweet corn. A very special tea indeed. I’m so excited that my son is on leave for the next week and has come home to be embraced by his family once again. This entry was posted in Chinese tea, Green Tea, Photography, Tea and tagged Long Jing tea, Lung Ching tea, Pre-Chingming tea. 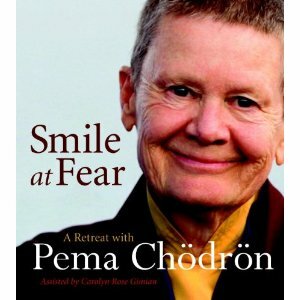 A new festival for me to learn about!